Gelegen op 25 minuten van een van 's werelds beroemdste schatten - Zion National Park - is dit comfortabele en rustige huis met 3 slaapkamers en 2 badkamers. Dit is een gloednieuw huis en is goed ingericht, met alle gemakken van thuis om van te genieten. Een prachtige inrichting van het zuidwesten en eenvoud maken het gemakkelijk om te ontspannen en te genieten. Breng uw mountainbike of ATV's mee naarmate u in de buurt bent van enkele van de beste locaties voor paardrijden. Lopen in de kast in Master Bath. 8 personen comfortabel. 2 Flatscreen tv's met directe tv en draadloos internet. Wasdroger. Moderne keuken is volledig uitgerust. Eigen garage voor 2 auto's. Eigen patio met barbecue, vuurplaats en uitzicht op de bergen en de canyon. Wandelpaden en mountainbikepaden in de buurt. 25 minuten naar St. George en 25 minuten naar Zions National Park. We loved our stay! The house was perfect. It’s beautifully decorated and VERY clean. The home’s distribution and high ceilings provide a sense of space and privacy at the same time. The neighborhood was quiet and safe. The location was perfect to visit Zion several times during our stay. Good beds with extra pillows and blankets. The owners and manager were very responsive and attentive to our questions even during Christmas Eve, thank you for that! We use VRBO regularly and have vacationed in many homes over the years. This home truly stands out as one of the best! It has a great view and a nice backyard. Its close to many good restaurants, Zion and Bryce canyon. The pizza wagon take out is delicious and cheap! 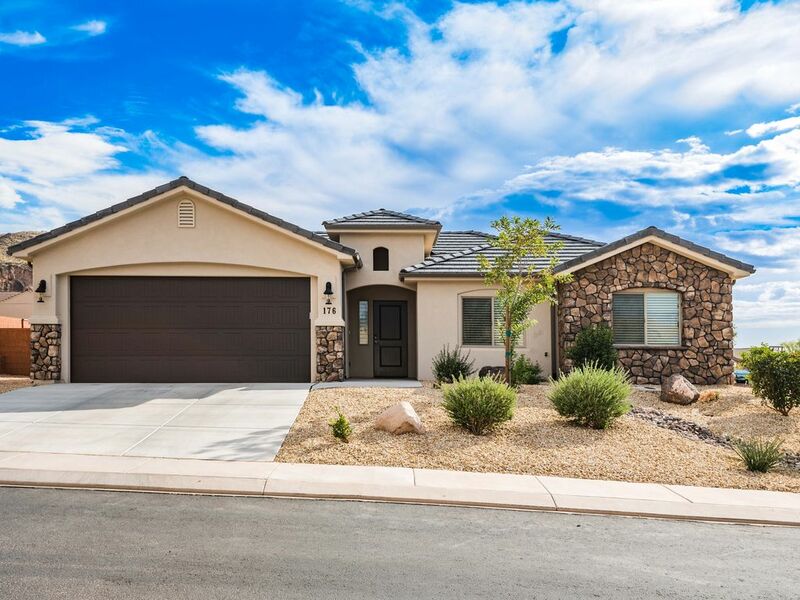 This home was newly decorated, super clean and had everything you could ever need. The beds were very comfortable too. There was plenty of towels, blankets and supplies. They even left us shampoos, soaps and dinner mints by the bed. The owners have thought of everything! I would definitely recommend and hope to visit again! This was a very cute 3 bedroom home that fit my family of 5 perfectly. My husband and I loved sitting on the patio in the morning enjoying the sun in November! The fire pit would have been fun if it hadn't been a little too cold in the evenings. There could be a few more dishes, there were only 3 cereal bowls but we made do. Loved the quiet area and it was close to many different activities and we got prompt response when we had a question upon our arrival, thanks for a great getaway! We had a wonderful time staying in this beautiful house. It had all the things we needed for our comfort. We really enjoyed hanging out and BBQing, then enjoying the fire pit while our little ones played on the grass. I definately would stay here again. very clean and well laid out home. close to zion national park, great places to eat nearby.it was nice to relax around the fire pit after a long day of softball at the huntsman senior games or hiking in zion. the landscape could use a little TLC, but other than that it was great stay! We stayed for three nights at this lovely property. It is a twenty mile drive to the south entrance of Zion NP and we used this as our base to explore the park. The house is very comfortable and was well appointed with everything we needed for our stay. The house and yard are well maintained and we enjoyed sitting in the backyard around the fire pit after a day of hiking. We would definitely stay here again if we are in the area.